Crabcakes validated her 2-5 favoritism in Saturday's $100,000 Maryland Million Distaff at Laurel Park, successfully defending her title with a half-length triumph over My Magician. The seven-furlong handicap for fillies and mares kicked off the 33rd edition of the Jim McKay Maryland Million program of stakes for Maryland-sired and Maryland-bred horses. The Bernie Houghton-trained Crabcakes, who carried highweight of 123 pounds, also won the 2017 running of the Distaff by a half-length over My Magician. Ridden by Forest Boyce, the 4-year-old daughter of Great Notion stalked the pace along the backstretch before taking over from a tiring early pacesetter Up Hill Battle entering the turn leaving the backstretch. Crabcakes showed the way under a patient ride on the turn, where she was challenged to the outside by My Magician. The challenger tried valiantly to overtake the favorite through the stretch run, but Crabcakes maintained a half-length margin to the wire. Owned by Morgan's Ford Farm, Crabcakes raced in the colors of her late owner/breeder Binnie Houghton's Buckingham Farm while running seven furlongs in 1:22.85 on fractions of 23.38 seconds, 46.95 and 1:10.75. My Magician, who was sent to post at 7-1 odds under Jomar Torres, finished 2 ½ lengths ahead of Anna's Bandit and jockey Xavier Perez. Crabcakes won her ninth race from 15 career starts, as well as her seventh win from nine starts at Laurel Park. “I don't know what we're going to do with her yet. She loves Maryland. I'd love to keep her in Maryland,” said Houghton, noting that the Barbara Fritchie (G2) next February is a long-range goal. Linda Zang's Lewisfield overwhelmed six rivals in Saturday's $100,000 Maryland Million Sprint, prevailing over runner-up Greatbullsoffire by 8 ¼ lengths in the six-furlong dash for 3-year-olds and up. Ridden for the first time by Jevian Toledo, the 1-5 favorite broke alertly from the starting gate to closely track pacesetter Onemoregreattime along the backstretch and around the far turn before easily taking the lead on the homestretch turn. The 4-year-old gelded son of Great Notion, the 126-pound highweight, moved away from the field with complete authority while conceding between eight and 16 pounds to his rivals. “He definitely brought his 'A' game today. He'd been training great,” trainer Jeff Runco said. “We were just hoping for a great break and clean trip, which he got. He ran super today. Greatbullsoffire, who captured the 2016 Maryland Million Nursery, rallied to finish second, 1 ½ lengths ahead of Stolen Love. Lewisfield ran six furlongs in 1:09.08 while winning his sixth race in 13 career starts and fifth victory in eight starts at Laurel. 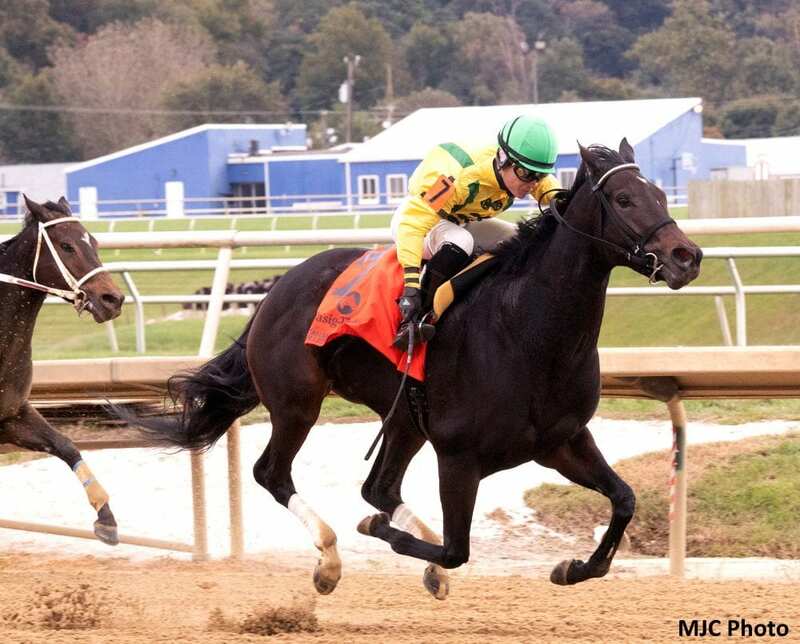 This entry was posted in Racing and tagged bernie houghton, crabcakes, Forest Boyce, great notion, Jim McKay, laurel, laurel park, lewisfield, Maryland Million, maryland million distaff by Press Release. Bookmark the permalink.